U.S. markets up soundly for the week; Friday’s performance boosted by a strong nonfarm payrolls report which subsequently advanced markets across the board. Trade talk remains a focus, but tariff impact worries abating. S&P 500 Index +1.7%, Nasdaq +1.8%, Dow +1.8%, Russell 2000 +1.6%. Financials (+2.5%), industrials (+2.2%) top sector performers. Rate-sensitive telecommunications (-0.1%), utilities (+0.3%) lagged. Positive breadth on NYSE (2.8:1); trading volume below average (~88% of 30-day avg.). Treasuries declined from risk-on trading; 10-yr. note yield +3 basis points to 2.89%. Commodities: WTI crude oil prices rebounded sharply (+3.2% to $62.04/bbl.) on drop in U.S. rigs; COMEX gold +0.2% to $1323/oz. ; industrial metals closed mixed; U.S. dollar mixed vs. major crosses. Economic data: U.S. nonfarm payroll report trounced expectations (+313K vs. +205K); oil aided by weekly decline in active North American rigs (-26 to 1257). U.S. equities opened higher following strong momentum from last week; Friday gains helped by “goldilocks” employment report. European stocks up midday as global rally continues. Worries over a trade war continue to diminish. STOXX Europe 600 0.4%, DAX 0.6%, CAC 40 0.2%, FTSE 100 +0.1%. Asian markets broadly green even though there is uncertainty surrounding the possibility that a U.S.-North Korea meeting may actually take place. Nikkei +1.6%, Shanghai Composite +0.6%, Hang Seng +1.9%. Treasury yields advance; 10-yr. yield flat at 2.90% after jumping on Friday’s strong jobs report. Commodities: Oil is lower (-0.8% to ~$61.55/bbl. ), gold -0.5% to ~$1317/oz., industrial metals lower across the board as U.S. dollar firms. Economic releases: No major economic data due today, but February CPI report due out tomorrow will be heavily watched. Leading indicators are providing few warning signs. In honor of the bull market’s ninth birthday, we looked at some of our favorite leading economic and market indicators in last week’s Weekly Market Commentary. In this week’s commentary, due out later today, we will look at three more: The ISM Manufacturing Index, the Treasury yield curve, and stock valuations. Collectively, we believe these leading indicators are signaling further economic growth and stock market gains ahead. The steepness of the yield curve, combined with the historical lag time until recessions have started, suggests this indicator may not provide a worrisome signal for quite some time. The ISM Manufacturing Index is signaling solid manufacturing activity and robust earnings growth ahead with no sign yet of a meaningful peak. Although valuations are high, they are decreasing as earnings continue to ramp and are generally less effective as a timing tool. February’s jobs report saw payrolls expand at a significantly faster pace than markets expected, though a moderation in wage growth helped offset any market concerns about a faster pace of Federal Reserve (Fed) rate hikes. We don’t expect wage growth to move high enough to warrant a more aggressive Fed in the near term, but it’s worth noting that month-over-month growth in average hourly earnings remains near the top of its post-crisis trend, and other indicators such as the Fed’s Beige Book, and a tight labor market may mean that wage growth remains worth watching in the near future. We dive into the report in more detail in this week’s Weekly Economic Commentary, which will be published later today. President Xi remains indefinitely. China has lifted the presidential term limits from its constitution, allowing President Xi to remain in power indefinitely. This was expected and most market participants view this as a positive for China. Big week last week. In the face of a potential trade war and the departure of the White House top economist, stocks still had a great week. The S&P 500 gained 3.5%, with financials, industrials, and technology leading the way. In fact, semiconductors, the Nasdaq, and micro cap stocks all closed at new all-time highs, as did many financials stocks. Small caps had a big week as well (up more than 4%). We came into 2018 with small caps as one of our favorite areas to find alpha, and it still looks attractive. For more of our thoughts on this group, check out this LPL Research blog. This week, the U.S. economy will be focused on inflation, retail sales, and housing. The CPI report comes out on Tuesday, with the headline inflation rate expected to nudge higher to 2.2% year over year in February, while the core rate is expected to remain unchanged at 1.8%. Mid-week producer prices and retail sales are scheduled to come out on Wednesday; and housing starts and building permits data are expected to be released on Friday. In Europe, though next week’s calendar tends to be light, a few events will garner attention. In the Eurozone, industrial production estimates are expected to tick higher likely following previously released data in Germany and the United Kingdom which moved higher in January. Eurozone inflation data (Core CPI) is set to be released on Friday and may edge higher mostly due to the regions Services CPI moving higher in February. 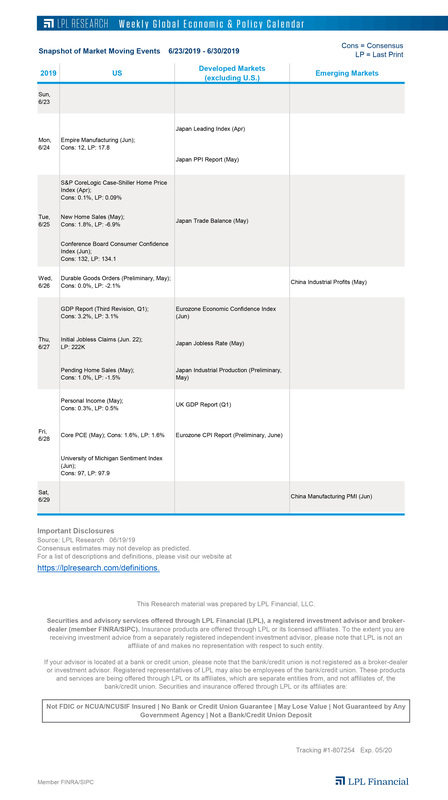 In Asia, China’s monthly activity indicators are in focus with industrial production, retail sales, and fixed asset investment data being released. In Japan, the Producer Price Index and machine orders are the main data points to monitor.